Sometimes your beloved Orange Tonic Mask just isn’t enough. It’s a lovely facial mask any other day, but on the hottest, muggiest, sweatiest of days, you need something stronger. Get that excess shine off of me, your face says. The pores scream: We need to breathe! 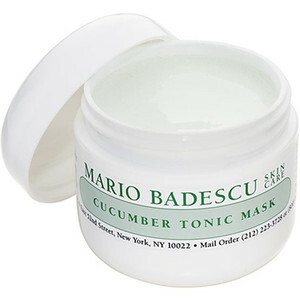 That’s when you call in for backup: Cucumber Tonic Mask is here to save the day. Let it do the dirty work and absorb all the gunk and oil. Can you hear your skin give an audible sigh of relief? Let it soothe those pores, those poor, poor pores. Twenty minutes (of bliss for you!) is all the Cucumber Tonic Mask needs to do the job; cleanse your face and you’re left with a smoother, more refined complexion. See the difference. Feel the difference. Goodbye impurities! Hello clean! Kaolin Clay and Cucumber Extract are to thank – they’re what make this mask the strongest of our line of cleansing tonic masks, perfect when you’re in search of something that will give you the ultimate clean. Which of our Tonic Facial Masks is your favorite?